The Davis Memorial is a finalist for the 8 Wonders of Kansas because of the grandeur and controversy of this massive marble cemetery memorial! Kentuckian John Davis moved to Brown County in 1878. He met and married Sarah and they settled north of Hiawatha. They were hard-working, frugal and childless. They moved to Hiawatha in 1915 and lived ordinary lives of quiet routine. When Sarah died in 1930, John Davis suddenly became a big spender. He removed a simple "Davis" headstone from his wife's grave in Mt. 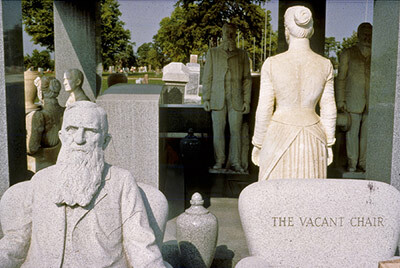 Hope Cemetery, and began to erect a massive memorial to the "sacred memory" of his wife. In a few years, 11 Italian marble or granite life-sized statues were positioned beneath the canopy or surrounding it. These included an empty overstuffed chair, a winged angel-version of Sarah in prayer and figures of Davis without his left hand, which he lost to infection. As the memorial grew, so did the dismay of townspeople. These were the years of the Great Depression and community leaders wanted Davis to underwrite a hospital. He ignored their requests. His stubbornness in the face of public criticism was prelude to a legend. Some of his peers insist that Davis never treated his wife as royally in life as he did in death. They suspect his generous gift was intended more as a slap in the face to his wife's heirs than it was a tribute to Sarah. He had a marble and granite wall erected to discourage visitors from walking among the statues. Into the 1940s, the eccentric Davis visited the memorial weekly and sometimes personally greeted tourists. 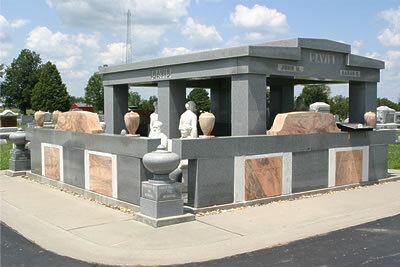 The irony is that the Davis Memorial has benefited the community. Every year thousands of visitors come to Mt. 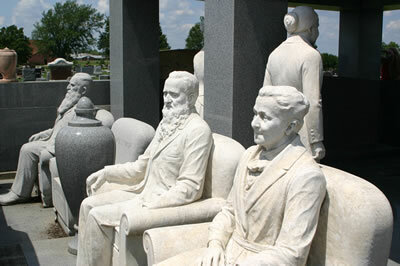 Hope Cemetery to view the marble statuary and to hear the story of the memorial's eccentric creator.